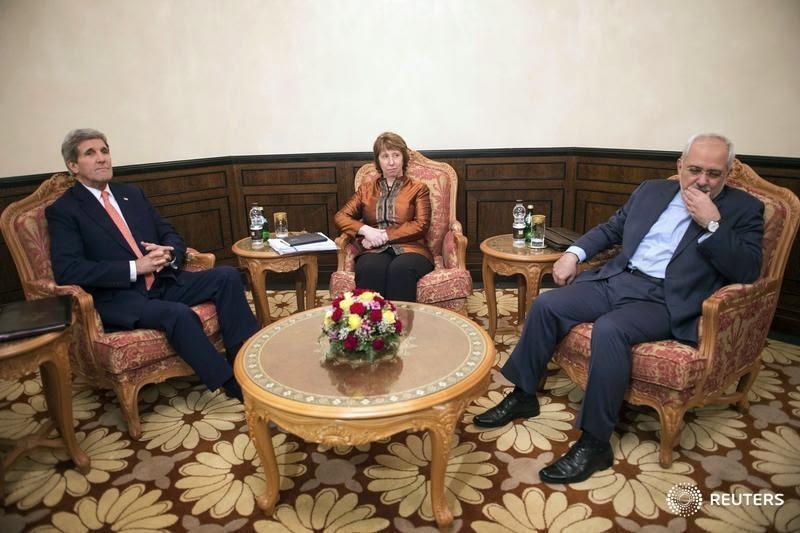 Senior-level nuclear talks among U.S. Secretary of State John Kerry, Iranian Foreign Minister Javad Zarif and EU envoy Catherine Ashton ended today in Muscat amid no signs of progress. Iranian negotiator Abbas Araqchi summed up the results of 2.5 days of what has been described as tough and serious talks: Can’t say we progressed, can’t say we regressed. The negotiators from P5+1 and Iran will resume talks in Muscat on Tuesday ahead of a last-ditch push in Vienna next week to meet the 24 November deadline. The pace at which sanctions would be phased out, the length of any final accord, and Iran’s enrichment capacity are the toughest outstanding issues. that implies a really serious inspection program and that requirement results from many years of iranian concealment and dishonesty and refusal to meet IAEA requests for information. IAEA report after report to the UNSC that iran was non-compliant and defiant lead to round after round of sanctions...and sanctions aren't going to be lifted merely on the basis of Iran's issuing words of assurance and making promises to be good. sometimes there comes a point where talk must give way to action. In this instance, sad to see the Leverett's track record of reliable analyses again demonstrated correct. Their perspective has been pessimistic that this round of negotiations would conclude in an agreement. But there is an upside. The two diplomatic sides representing U.S. and IRI have gotten to know one another, and while relations are normalized they do communicate regularly. Little doubt this will continue. Zarif's body language sums up the hopeless situation. The US and Iran are the only two protagonists in this circus as rest of the P5 are not really interested. China and Russia more or less support Iranian position, Germany, UK and France are mere US puppets and will go along with anything as per US commands, the main problem now is that Obama is a totally legless duck after the Republican's getting control of Senate and resurgent AIPAC/Zionist lobby as summed up by Netanyahu yesterday dismissing any deal. As any rational analyst of US politics knows that as long at US foreign, defence and economic policies are hostage to Zionism, there can be no deal with Iran or any Muslim nation. US agenda is endless wars and destruction in the region unfortunately for Zionist hegemony and oil interests. It is a sad fact that the region is in for more conflict that will focus of Syria and Iran next. Actually, every IAEA report states there is no diversion of nuclear material and Iran is in compliance. That is the mandate of the IAEA. The nuclear dispute is political in nature. Have you read former IAEA Director Mohamed ElBaradei's book on the subject? In order to render a more informed commentary, it is suggested you do so. Mark, all due respect, but you're really not anybody who tells much of the truth or has anything other than a misplaced sense of your own erudition if you believe that you've the standing to tell other people what they might do so as to offer informed commentary. partisan fanboys who routinely ignore the elephant's body and insist the only important part is the tail have little credibility. the world ..and the Security Counsel... quite firmly ignore the laughingly ignorant claim you offer about the scope of the tasks delegated to the IAEA. "verifies through its inspection system that States comply with their commitments, under the Non-Proliferation Treaty and other non-proliferation agreements, to use nuclear material and facilities only for peaceful purposes." try telling the whole truth and learn not to condescend to people. you'll be less of a liability to the blog and less of an embarrassment to yourself.
" Zarif's body language sums up the hopeless situation." yes, he was sent to try to see if Iran's position was even possibly workable and it's not an enviable assignment.